Ropes may be of a right-hand lay or left-hand lay, but the most common is right-handed. It is essential to realise that each of the components is turned (twisted) up in an opposite direction to that of its predecessor, e.g. 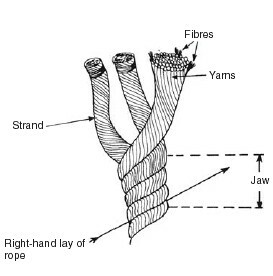 in right-hand lay, strands are laid up right-handed (clockwise), yarns laid up left-handed, and fibres laid up right-handed. Rope should be inspected internally and externally before use for signs of deterioration, undue wear or damage. Manilla is obtained from the abaca (wild banana) plant, which grows to about 9 m (30 ft) in height, largely in the Philippine Islands, and is exported via the port of Manila, from which it acquires its name. Manilla rope is not as durable as hemp, but is most certainly more pliable and softer. It is gold-brown in colour, and never tarred. Unfortunately it swells when wet, but despite this it is considered by far the strongest natural rope made. It is very expensive and its availability will depend on the political climate. Used extensively where the safety of life is concerned, Grade 1 manilla is the best that you can get,but because of scarcity, and, of course, the cost to shipping companies, it is a rare feature aboard merchant vessels. An experienced seafarer likes manilla, because it is the best. There are many so-called grades of manilla on the market, such as sisal mixed with manilla, which are not quite the same to a professional. No disrespect to these other grades of ropes, but when you need reliability with a natural fibre, this is the one to use. Manilla is an excellent fibre for the manufacture of towing hawsers, providing good spring and stretch facilities. It is not generally used for running rigging because it swells and expands, often jamming in the block. All manilla fibre rope manufacture process consists of twisting the fibres into yarns and turning the yarns in an opposite direction to establish the strands. Sisal Ropes Obtained from the leaves of the plant Agave sisalana, a large plant of the cactus family, sisal comes largely from Russia, America, East Africa, Italy, Java and countries in Central America. The plant favours a temperate or tropical climate. The sisal rope is hairy, coarse and white. It is not as pliable as manilla nor as strong.When wet, it swells up more than manilla, as the water is absorbed more quickly, and it becomes slippery to handle. It is extensively used in the shipping industry either in its own state or mixed with manilla fibres, a good sisal being similar in strength to a low grade manilla.The cost of production is better suited to the shipowner, and the supply is more reliable than manilla. For handling purposes, the fibres have a brittle texture, and continued handling without gloves could cause the hands to become sore and uncomfortable. It is generally used for mooring ropes and most other general duties aboard, where risk to life is not in question.Where the rope is expected to be continually immersed in water, it may be coated with a water repellent. This is a chemical coating, usually tar based, which prevents rotting and mildew. Hemp is obtained from the stem of the plant Cannabis sativa, which yields flax for the production of canvas. (The word canvas is derived from the Latin ‘cannabis’, which means hemp.) This was accepted as the best rope in the marine industry from the early developing days of sail. Cannabis sativa is cultivated in many parts of the world – New Zealand, Russia, China, India, and the USA, for instance – but has been replaced mainly by man-made fibre ropes and manilla. All hemp fibre rope manufacture process consists of twisting the fibres into yarns and turning the yarns in an opposite direction to establish the strands. The hemp fibres are a light cream in colour when supplied to the rope manufacturer.They have a silky texture and are of a very fine nature: hence the extra flexibility of the hemp rope compared to a sisal or manilla. Most hemp ropes treated in manufacture produce a tarred, brown rope which is hard and hairy to the touch. Its strength will be dependent on the place of production. Italian hemp ropes are now considered to be the best quality, having about 20 per cent greater strength than a high grade manilla. However, quality differs considerably, and hemp ropes are rarely seen at sea today except in the form of small stuff, e.g. lead line – cable laid hemp, sea anchor hawsers, bolt rope etc. The advantage of hemp rope is that it is impervious to water and does not shrink or swell when wet. For this reason it was extensively used for the rigging of sailing vessels, and roping sails.When used for running rigging, it was preferred to manilla or sisal because it did not swell up and foul the blocks.However, for vessels navigating in cold climates, hemp ropes do have a tendency to freeze up. Not all hemp ropes are supplied tarred, so that the weight will vary, together with the strength. Sometimes referred to as grass line, coir is obtained from the fibres of coconut husks. It is mainly exported from Sri Lanka (formerly Ceylon) and ports in India. It is a very rough, coarse and hairy rope, with only about one quarter the strength of a hemp rope.However, it is very light and floats, possessing great elasticity. It is often used as a towing warp or mooring spring, because of its buoyant and elastic properties. The coir fibres are short, brittle and thick.These features produce a stiff non-flexible rope, difficult to manage. Consequently they are not popular with seafarers.When used for mooring purposes, they often have a steel wire pennant attached, and the whole is known as a coir spring.These are regularly encountered where heavy swells are common, often being run from the shore, as a permanent mooring picked up by the ship on berthing. This rope is never tarred, as this would weaken the fibres considerably. If the rope becomes wet when in use, it should be dried before being stowed away.The coir fibres are found aboard many vessels in the form of coir door mats.